During the summers of 2014 and 2015 heavy rainfall caused more than 100 properties in Brighton & Hove to flood as sewers and drains were unable to cope. Anyone interested in practical measures to reduce flood risk can now take part in an eight week consultation on guidance to help developers, architects and landscapers design sustainable drainage systems (SuDS) for new developments around the city. Comment on the SuDS planning document. The consultation runs from 5 December to 31 January. Sustainable drainage systems mimic natural processes by storing and treating rainwater close to where it falls. They can also improve air and water quality, increase biodiversity and create spaces for public amenity and recreation. Methods include diverting water off the highway and onto nearby green space through a shallow trench or ‘swale’; creating ‘rain gardens’, installing paving that allows water to drain through and temporary storage tanks that release the water slowly back into the watercourse. Using these methods slows down water flow and reduces the volume of surface water runoff. SuDS can create new wildlife habitats such as ponds, water features and green roofs and increase areas of vegetation to ‘mop up’ the water and help it evaporate naturally into the atmosphere. 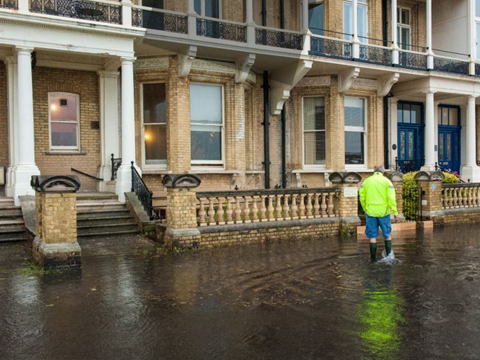 Brighton & Hove is one of the top 10 flood risk areas in England and has been affected by surface or groundwater flooding for the last 20 years. The city council has been at the forefront of exploring measures to tackle areas at risk. Rain gardens created in Portslade have reduced the impact of heavy rainfall in the area. The council is also exploring better water management in the Carden Avenue and Norton Road areas of the city* where sloping roads can cause surface water flooding and is an active partner in the Brighton ChaMP for Water project, a partnership between the council, South Downs National Park Authority, the Environment Agency, Southern Water and the University of Brighton, with the Brighton and Lewes Downs Biosphere and Natural England - working together to protect the quality of groundwater in the Brighton aquifer which supplies most of our drinking water. Councillor Gill Mitchell, chair of the city’s environment, transport and sustainability committee, said: “With extreme weather becoming more common we need to find ways of reducing flood risk. Having a natural drainage system in place is vital in densely populated urban areas like Brighton & Hove and has the benefit of improving the local environment. *This is part of the INTERREG 2 Seas Shaping Climate Change Adaptive Places (SCAPE) project of which Brighton & Hove City Council is a partner. This project receives financial assistance from the European Union and aims to design innovative water management solutions for managing water in coastal landscapes to reduce the risk of flooding making them more resilient to climate change.